Intergalactic Real Estate is part of the Silly Services brand of websites created to amuse and entertain you (and also make us a little bit of money). Intergalactic Real Estate is a division of JaredJared Enterprises located in Cleveland, Ohio on a planet owned by Jared. To quote Descartes - 'I sell planets, therefore I am'. 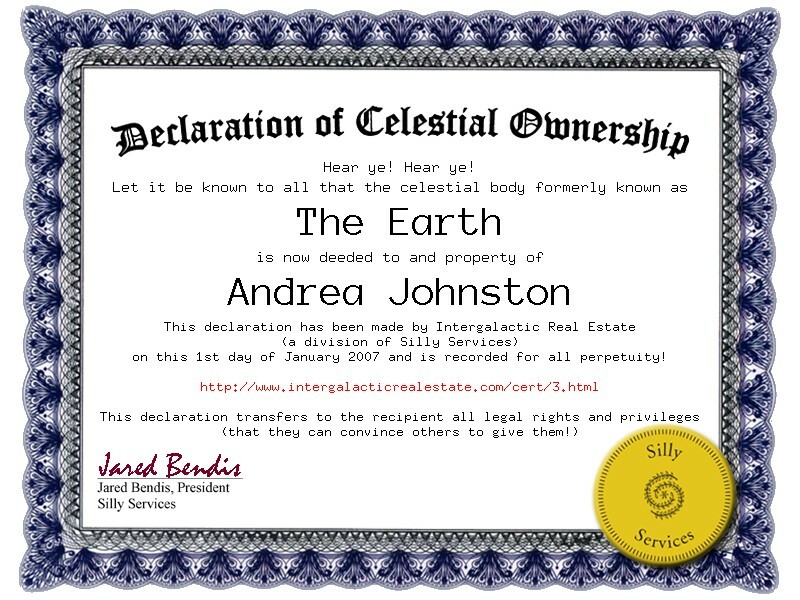 We create an online customized Declaration of Celestial Ownership detailing the celestial body�s new owner and all the rights and privileges that go along with it. This is available as both a weblink and a downloadable image (for integration into your website, MySpace, Facebook, or whatever). We at Intergalactic Real Estate feel that there are just not enough silly services in the world. We also feel that some people deserve the honor of having of owning a planet. What if owning a planet isn't my cup of tea? They take themselves seriously � we don�t. What if I run across someone who owns the same celestial body as me? Then you need to learn to share. Or to fight it out. Either way send us video. How 'intergalactic' is your organization? Do you people know that the Sun is not a planet? Yes � but we don�t care. And what is this �You People� crap? Same question but for the Moon? Same answer and we still don�t care. Same question but for the Asteroid Belt? Same question but for the Milky Way Galaxy? La, la, la, la. Still not listening. Can I own celestial bodies currently not offered? What? The solar system isn�t good enough for you? Sure! Make us an offer and we will see what we can do.